We wade through the tall grass, my Darton youth bow in my hand, and arrive at the tree where the stands are. I show Larry the property lines and he sets off to find a place to sit. We climb into our stands and settle in, completely unaware that our sit wouldn’t be as long as we thought it would. We see 2 does walking towards the tree line as Wes pulls out his rangefinder. “30 yards. Too far.” Resting my back against the truck of the tree, we wait in hopes that these does will return. The evening wears on and soon we hear movement in the brush. Looking towards the source of the noise, I see the does. They walk along the edge of the garden, meandering their way towards us. After ranging the doe, Wes gives the command to stand up and slowly draw my bow back. I mimic his actions, placing my pin on her vitals and waiting for the green light. Before I know it, I hear a whoosh as Wes’ arrow leaves his bow and passes through the doe at 17 yards. I follow the deer with my eyes to see where she went before we climb down out of the stands. My heart is racing, my hands are shaking, and I can barely contain my excitement. Wes comes over to me, bloody arrow in hand, he’s breathing heavily as well. “What did you think about that?” I can barely process what just happened, but I know the feeling is something I want to experience again. “Can I shoot the next one?” are the words that flowed out of my mouth. I was hooked and I couldn’t get enough. I didn’t take the shot but I was still hooked! Wes was my boyfriend then, today he’s my husband! Here’s to a lifetime of hunting together! Two years later and I’m in full camo sitting out in a mosquito infested field on Wye Island. I had upgraded my bow to a Mission Craze II. 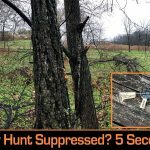 I’m crawling on my hands and knees through the wet grass, trying to reach the corner where I can set up near a little buck I had spotted across the field. Waiting for this buck to come closer, I sit down and before I realize it, I am completely surrounded by deer! There are five or six behind me, two small bucks across the field, and five or six deer on the long end of the field. That doesn’t include the small buck and two does standing right in front of me. I finally have my chance! I’ve been trying to shoot a deer for 2 years and I am finally going to take a shot. I set myself up, bow at the ready, and start drawing back while keeping my eye on the doe in front of me. As soon as I’m at full draw, I rise to my knees and settle my pin on her vitals. Without a rangefinder, I have to take an estimated guess about her distance. With my 20-yard pin hovering over her heart, my finger touched the trigger on the release and sent my arrow flying towards the deer. Moving on up to the Mission Craze 2! I had underestimated the distance. 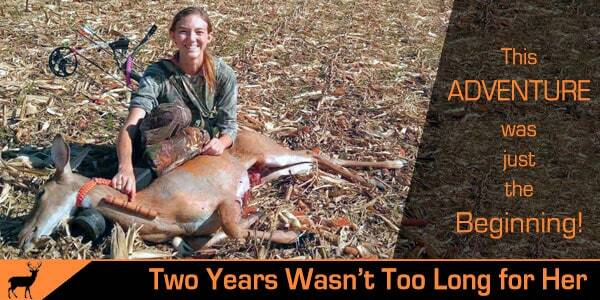 She was 25 yards, not 20. It didn’t end terribly; my 100-grain NAP HellRazor broadhead stuck between her ribs, twisting as she ran away. The arrow turned her lung into mush. After she disappeared into the woods, I waited a few hours before getting out of the tall grasses and spooking the other deer. I walked out to where she stood when the arrow pierced her lung and didn’t find a single drop of blood. Searching for hours, I couldn’t find any blood, so I headed back to my truck to drop some supplies off and get something to drink. After casing the field again, I found the tiniest drop of blood and started following the trail into the woods. I found my doe, bedded down with my arrow still trapped between her ribs. She was dead already so I knew I wouldn’t scare her when I started shouting my excitement! I pulled my selfie stick from my pack, took a few pictures and then sat down in the woods to call Wes. “I found her! I did it! I shot my first deer!” I barely contained my excitement, until I realized what the next step would be. I had to field dress this animal. I had never done that on a deer. Bunnies, chickens, other small critters, yes. A large doe that weighed more than me? No. Wes walked me through the process using a speaker phone. It took a while, but I finished the job and started dragging her out. Little did I know that one fateful September day was going to change the course of my life. I have since grown my social media following and built friendships with amazing people in the outdoor industry. I can’t wait to see where my journey takes me next and I hope you’ll follow along! 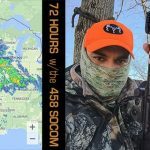 This entry was posted in Special Guests, Honorary SHWAT™ Team Contributors and tagged Bow Hunting, Deer, Deer Hunting, Hunting by guestwriter. Bookmark the permalink.